In the mid-to-late 1940s, Russ Takaki became the first Asian American big wave rider. Of course, in those days it wasn’t looked at like that. Russ was just one of the half dozen Hot Curl surfers who were challenging the waves all over O‘ahu; nothing more, nothing less. Then, there was Don Uchimura, on Maui. “I remember Don Uchimura was the first surfer here,” in 1941, Woody Brown told me. “When I came over I met him and we went... out in those big Kahului harbor waves,” before the harbor was dredged and the break lost its kick. Woody and Don were the first ones to surf Maui’s Paukukalo, which got up to 10-12 feet.” But this kind of range was under what Woody and Russ would ride later on in the 1940s at Makaha. His second year at school on O‘ahu is when he got into surfing. He was 18 and living in the Ka-imu-ki area of Honolulu, between Kahala and Waikiki. “I surfed some, before I went into the army,” he told me of the period just “befo’ da second world wahr,” “but not much, you know, [while] in school.” The boards he rode in those days were made out of California redwood. There was no rocker, no sophisticated plan shape, and the tails were wide. It didn’t take Russ long to adapt to the Hot Curl designs formulated before war hit the Pacific Theatre. I asked him when he made the switch from a redwood plank to a Hot Curl. I asked Russ who he remembered most in those days surfing after the war. He was quick to note the arrival of Woody Brown on the scene at the beginning of the war. Woody added hydrodynamic modifications to the Hot Curl design to make them better. Also on the scene was a much younger George Downing, just starting to come into his own. For Russ Takaki, the years 1948-49 at Makaha were the most memorable ones. He would continue to surf the place until the early 1980s. When did you guys head over to the North Shore? 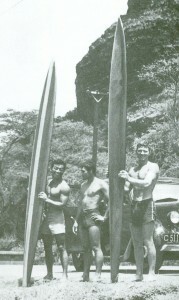 Through the 1950s and the waves of assaults on the North Shore by Coast haoles, the Hot Curl surfers continued to ride waves at Makaha and, occasionally, the North Shore. When they weren’t surfing, they were doing other competitive water sports and logging time in the water doing those things that helped put food on the table. “We used to dive for turtles off Waikiki way back when it was legal to hunt for turtles,” Russ recalled. “I had a 4-man canoe and we used ta use dat, you know, to go out, anchor and go fishing. Lotsa times we went for turtles. Then we would go for squid, too, sometimes. “For a while, Wally made racing paddle boards,” Russ continued. “We used to have – every Christmas. Even now, they still run it – every Christmas day we had a surfboard paddling race from Moana Hotel out to a bouy maybe half-a-mile, three quarters of a mile out, then around the Diamond Head bouy and back to Moana Beach. I asked Russ what was the best board he’d ever had? The one he liked the most? When did he have that board? “I t’ink, maybe, from around 1948, when Wally made it. That board was super light for that time. It was only ‘bout 50 pounds. That’s supah light fo’ dat time. Most boa’ds were 80-90 pounds or 70 at least. In 1951, when he met and married his wife, Russ started shifting his focus from surfing to his own budding family. I asked if, while he was bringing his family up, was he able to pass-on surfing to his kids? I asked Russ how long after starting his family did he continue to surf? Russ spent most all his adult work life working in Honolulu with juvenile delinquents and adult criminals – “what we called ‘Adult Parole,’” he told me. He got into this field after the World War. By the time of our interview in 1997, he had already been retired for 25 years, having ended his work in 1972. “Wally has had various jobs, you know,” Russ continued talking about how they made their living when they weren’t surfing, “but the last 25 years or so, he was with the Navy fire department, you know, for the island of O‘ahu and when he retired, he was a fire chief. He’s a very intelligent fella, you know. “... he went out to Castle with that board [an all-koa Hot Curl we’d been talking about earlier in the interview]. You know, that weighs a hundred and – what – 75 pounds? Whatever. He’s a guy full of ideas. Try anything. Good craftsman. “We used ta go spearfishing quite a bit, at one time,” Russ continued, talking about his friends Blue Makua, George Downing and Noah Kalama as well as Wally in the late 1960s, early 1970s. “We got chased in by a shark, once (laughs). Pretty scary. “I say: ‘I have. I’m coming.’ I thought he had a fish. “He said: ‘No, no. Mano.’ Mano means shark in Hawaiian. “John Kelly and I were driving toward the North Shore when – ah – President Kennedy was assassinated. It just happened that he and I were, you know, going surfing. It just happened that very morning was when the President was assasinated.” The two heard the news of it over radio and it had a wierd effect on them. I asked him about moments in surfing that really stood out? “There was another time John Kelly and I had gone to Sunset. It was kind of a blown-out day. The wind was too strong. It was huge, huge, ext’a huge. Actually, nobody had gone out [that day] because da conditions weren’t that good and the waves were too big. A little later, I asked what was the average big surf he’d surf back when he was active? Toward the end of our time together, I asked Russ who had influenced him the most? “I think Wally and Geo’ge Downing,” he responded right away. “Downing is probably 10-12 years younger than I am. But, ah, by the time he was, you know, late teenager – 18-20 – he was one’a da best. So, you were riding Hot Curls up until the late 1950s? Who do you stay in contact with? “Wally. I see Downing every once in a while. Most of the guys I don’t really see. Peter Cole – you heard’a him? ... Anyway, I run into him once in a great while... I don’t know if he still surfs. If he does, he must go North Shore. Probably. “You know, from my observation – well, we’ve travelled to Japan 3, 4 times now, you know, on tour trips. But, as a group, Japanese people are very racially prejudiced. I can say that because, you know, I’m Japanese. But, I look at them differently from the way I look at myself. I’m, you know, born and raised here,” he ended with a laugh. A particular favorite of his was Las Vegas, where he and members of his family vacation “a couple of times a year,” he told me with another laugh. And, is the first Asian American big wave rider still surfing? “Yeah,” Russ responded without hesitation. “Mostly Waikiki, now. I don’t want ta tackle da big stuff – North Shore – anymore. Too old for dat. Russ passed on in 2011 at the age of 92. Gault-Williams. Interview with Wally Froiseth, April 3, 1996. Akamine was probably who Woody refered to as a Korean kid. Gault-Williams. Interview with Russ Takaki, March 16, 1997. “Nisei” is a Japanese term meaning second generation living in lands outside of Japan. Gault-Williams. Interview with Russ Takaki, March 16, 1997. Gault-Williams, Malcolm. Interview with Russ Takaki, March 16, 1997. Also specified in Russ’ notations on the draft of the interview, July 1997. Gault-Williams. Interview with Russ Takaki, March 16, 1997. Russ was certain the trip was in 1949. The board must have been at least from that same year, if not earlier.